Summit Racing is one of the most recognized names in the high performance industry; eclipsing all other high performance retailers by a wide margin. Literally, millions of high-performance cars, trucks, hot rods, street machines and race cars have been built through the mail-order magic of Summit's vast enterprise. Summit's influence cannot be understated. It is extraordinary and far reaching with regular customers from America and around the world. Every day, hot rodder and racer conversations are punctuated by the phrase, "I'll get it from Summit." 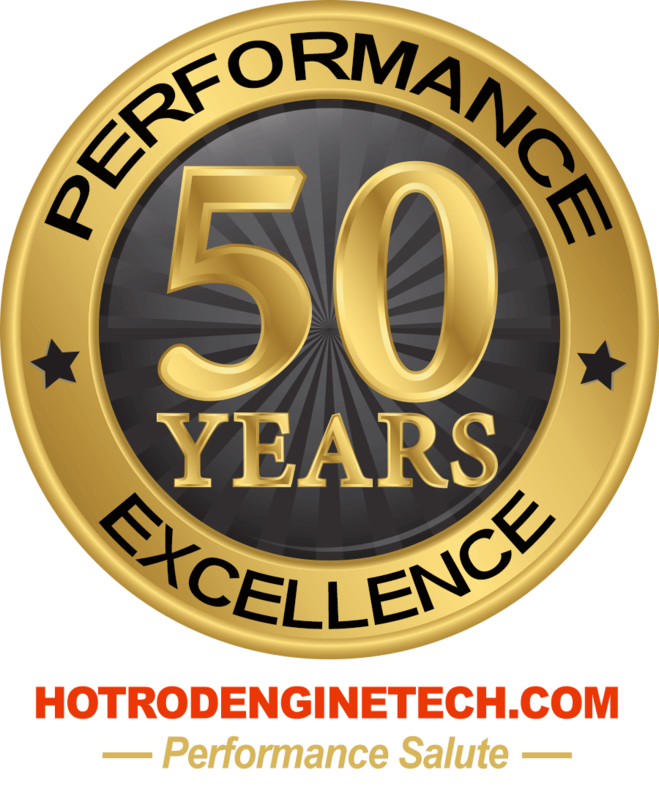 It is a household word of the high performance industry with as much name recognition as any of the pioneering companies who drive it. It would be difficult to find a hot rod, truck or race car anywhere that doesn't have some parts on it that came from Summit Racing. 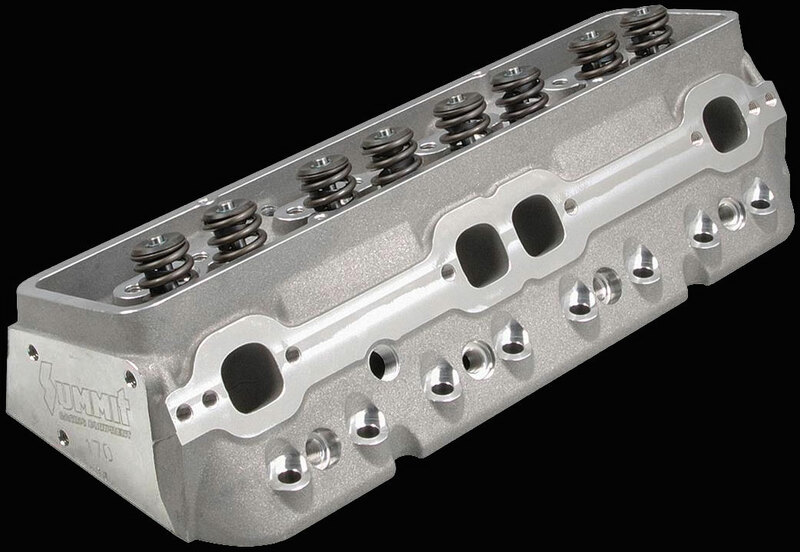 Chances are, if you have a performance car or truck or a race car, you have purchased parts for it from Summit Racing. 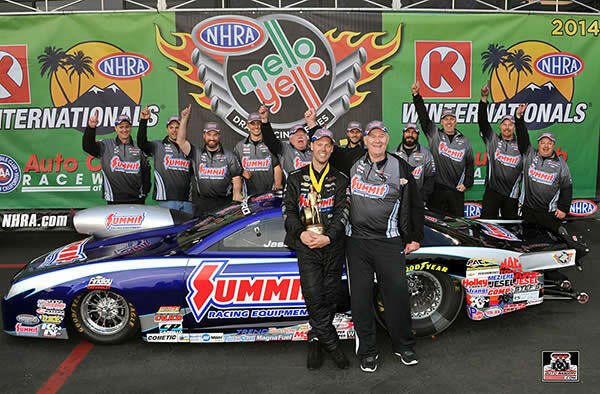 We congratulate Summit Racing on its success and broad support of the high performance Industry. 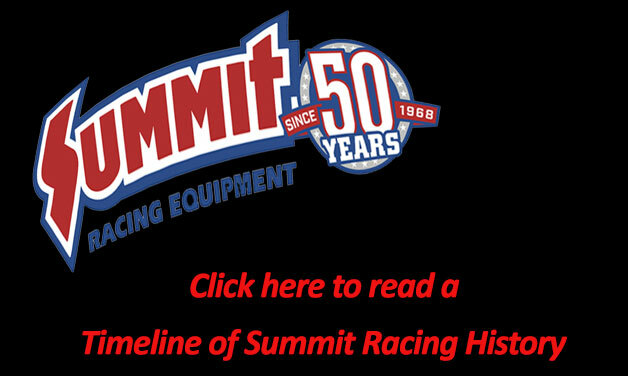 Well done Summit Racing Equipment. It began in 1968, started by a young engineer with a 1967 Corvette roadster equipped with the L71 427 cubic inch/435 horsepower engine. 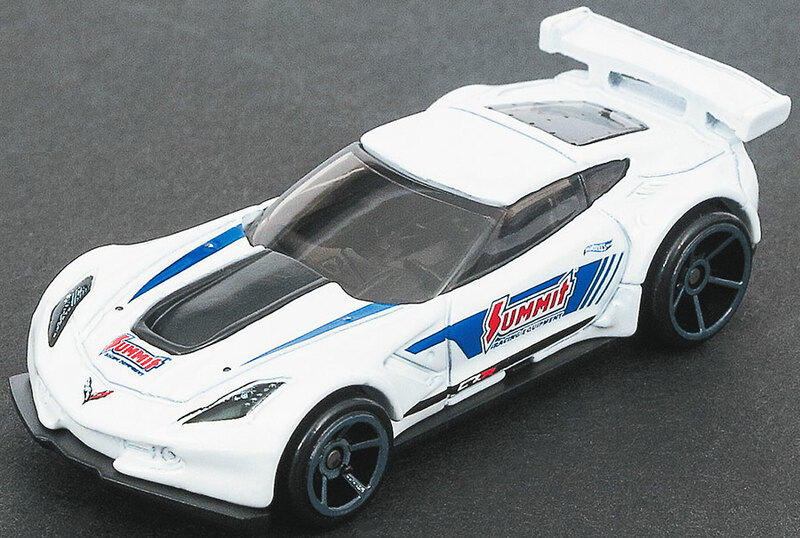 He made some connections to get hop-up parts at a discount, and it wasnu2019t long before his drag racing buddies found out and wanted the same deal. 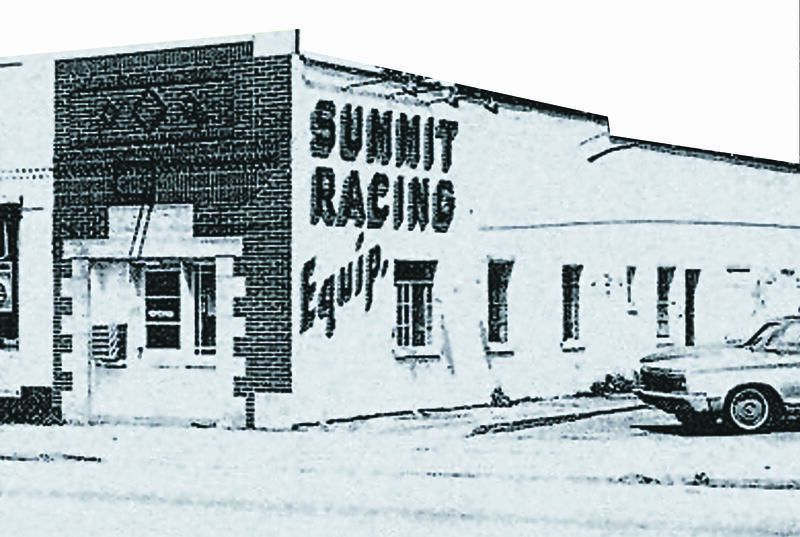 From such humble beginnings, Summit Racing Equipment evolved. Summit's first u201cstoreu201d was the basement of a donut shop in Stow, Ohio. The coffee and pastries were nice, but the location didn't get much traffic. A year later in 1969, it moved to its first true store next to a Midas Muffler and a pizza shop in Cuyahoga Falls, Ohio. That store was just 1,500 square feet, only 20 feet wide. 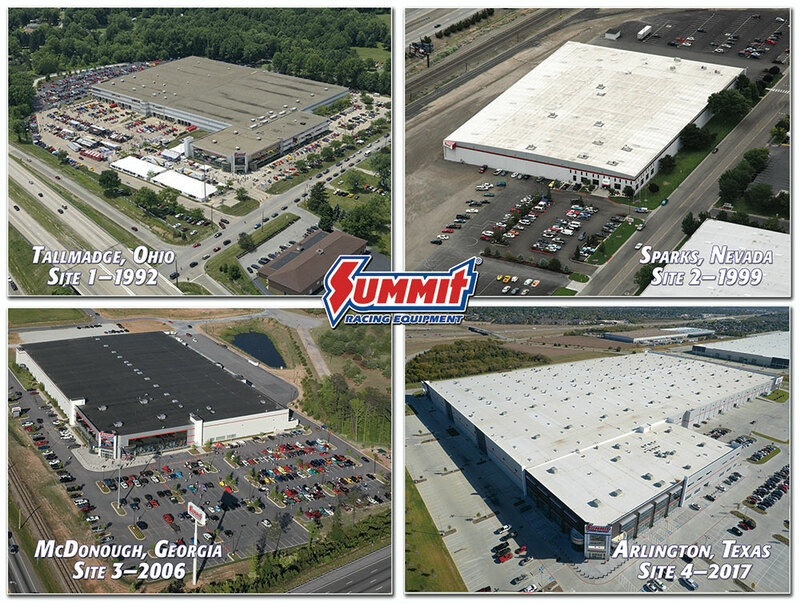 Today Summit Racing is a massive enterprise with hundreds of dedicated employees. Its Tallmadge, Ohio headquarters is just down the road from the companyu2019s original location. Here, the majority of the sales and customer service people make it seem easy, but beneath the surface, an army of purchasing agents, warehousing experts and maintenance personnel make it run like a well-oiled machine. The company runs 24/7. When youu2019re sitting at your computer ordering parts in your underwear at 3 am, you can be sure that your items will be underway in very short order because processing begins immediately. Orders go out from regional warehouses strategically positioned around the country, so you can receive your parts via ground shipping in as little as two days. Fully stocked facilities are located in Tallmadge, Ohio, Sparks, Nevada, McDonough, Georgia and now Arlington, Texas to allow fast efficient delivery anywhere in the country. Each of the satellite locations also features a fully stocked storefront for local pickup. The Ohio and Georgia facilities each exceed 25,000 square feet while the Nevada store has 11,000 square feet. The new Arlington, Texas facility boasts 32,000 square feet and all facilities are interconnected for fast customer service. 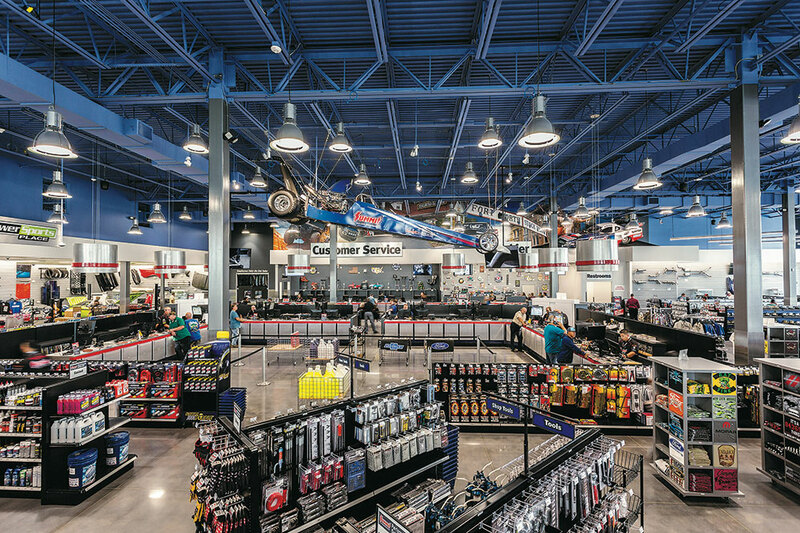 Summit Racing's performance parts showrooms are a speed shop junkie's paradise with every conceiveable part neatly displayed for examination or stocked nearby in the adjacent warehouse facility. 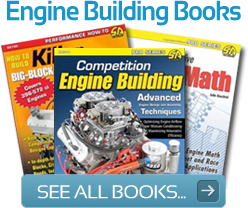 u00a0Summit catalogs are the racer's and hot rodder's bible and Summit super stores and strategic shipping centers make one-stop shopping so easy, you can build entire cars right out of the catalog. Summit streamlined the process to put all the parts you need on your doorstep as quickly as you need them. Well stocked distribution centers and full service online shopping make parts buying easier than ever. Summit's low prices and handshake guarantee have groomed everyone to shop Summit automatically. 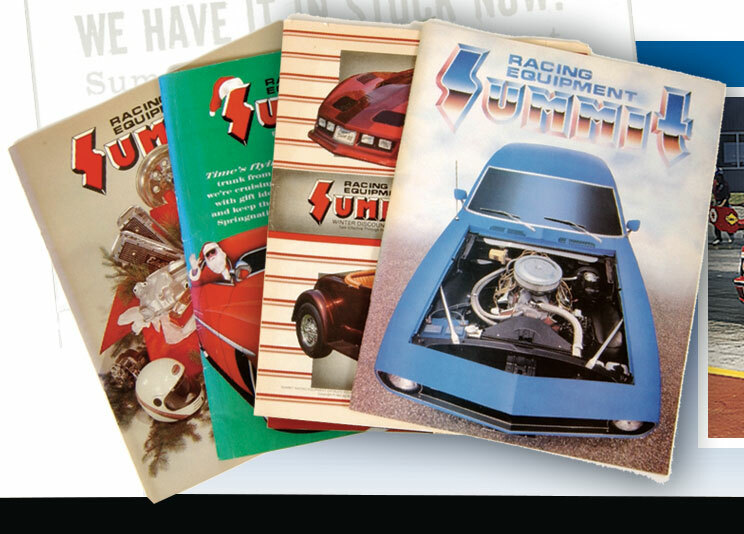 Summit Racing catalogs have long been the industry standard for ordering mail-order parts. If it's not in the Summit catalog, it probably doesn't exist. 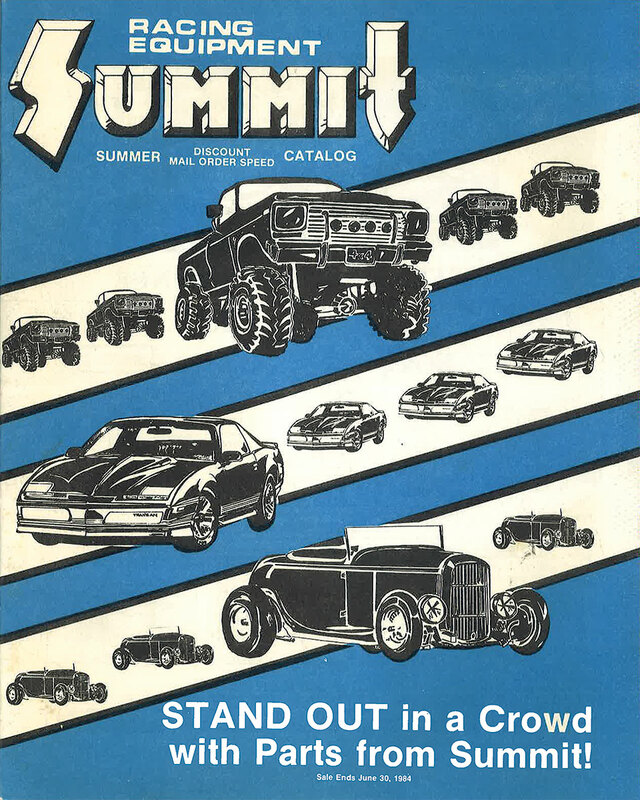 Summit catalogs have become collectors items in their own right.u00a0 Au00a0 Summit catalog resides on the work bench and tool box in virtually every shop in America. And as any wife will attest, there is one under the bed and on the back of the toilet in hevery gearheads house. In 1990 Summit Racing began adding a full color gatefold of a contemporary performance car to each of its bi-monthly catalogs. 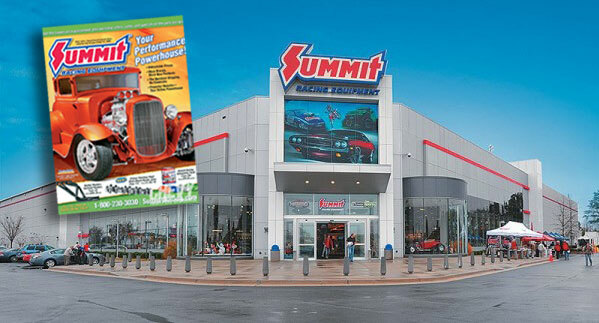 they were an instant hit and often eclipsed the quality of well know magazines.u00a0 Today, Summit gatefolds still grace the walls of home shops across the nation. Being selected for a gatefold shot was condsider a great honor. Summit's first in-house project car emerged in 1980. 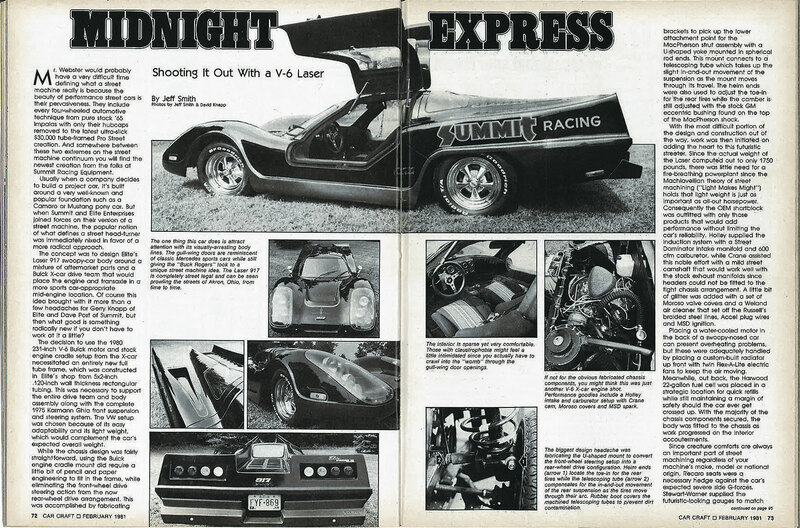 Summit joined with Elite Enterprises to create the Midnight Express, an Elite 917 Laser body wrapped around a Buick V6 in a mid-engine sports car configuration brimming with contemporary performance parts and suitably editorialzed by Car Craft editor Jeff Smith. 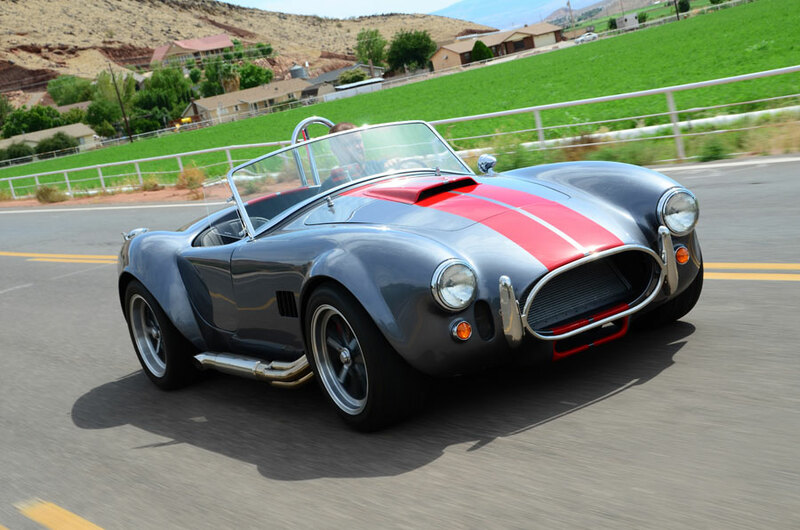 To support the growing kit car industry Summit put together a series of performance engine kits designed to match the Factory 5 Cobra kit cars with a full complement of go fast goodies. This enabled builders to outfit their cars with pre-designed and tested parts specific to their engine choice. Summit's website is constantly adjusted to ensure an optimum shopping experience that helps you find the product you are seeking quickly and easily. The online store incorporates robust navigation features, including make and model, year, engine family, keyword, and part category to help you shop. The navigation bar allows shoppers to narrow search results by attributes, such as price range, material, exact engine application, and more. Each part displayed shows in-depth product information and recommendations for tools and installation accessories, related products, instruction sheets and verification that the part does indeed fit your specified vehicle. And every part description also contains customer reviews and rankings with comments about the products. 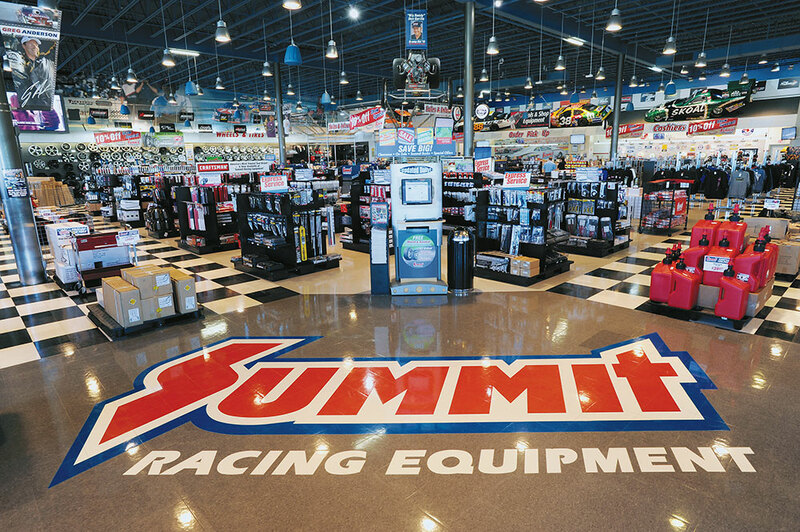 Summit has steadily grown its in-house brands covering a broad range of performance products. 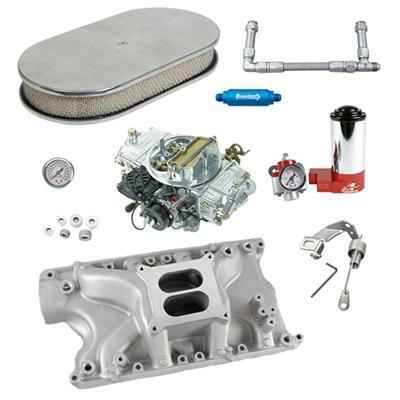 This enables Summit to provide its own high-quality branded parts at rock bottom prices. By selling a range of Summit branded products factory direct, it passes the savings on to its customers. Buyers can also take advantage of the Summit SpeedCard credit card with up to 360 days of interest free payments. The SpeedCard offers three interest-free payment options-360 days interest-free on purchases over $1,000, 180 days interest-free on purchases over $500, and 90 days interest-free on purchase over $150. Ther is no annual fee and it comes with 12 months of free emergency roadside assistance, including tire changes and jump starts. Within the Summit catalog customers find many instances of special u201cProfessor Overdriveu201d tech tips covering everything from carb jetting tips to tire selections. 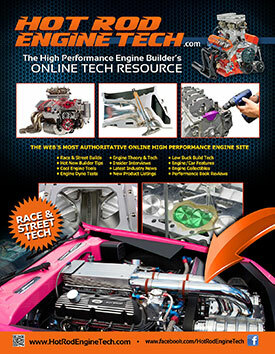 Actual customer questions are answered in the catalog by the professor and a full range of Summit Racing tech advisors. 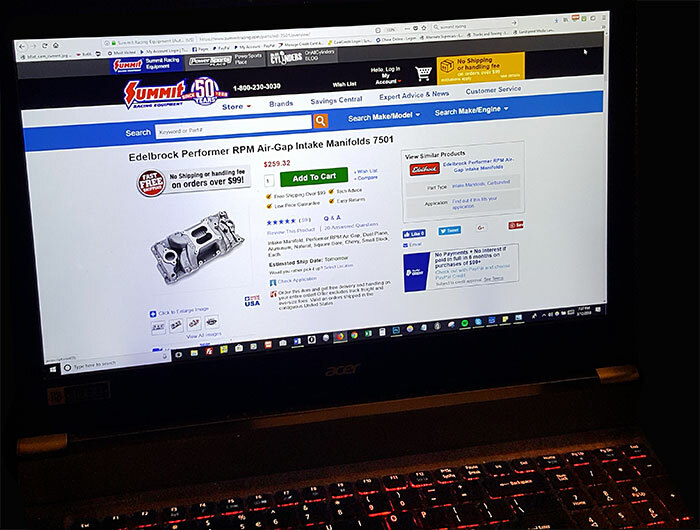 This assures customers that Summit has their performance answers and it helps them make more informed buying decisions that produce better results on their race cars and hot rods. Professor Overdrive represents the extraordinary technical depth of Summitu2019s tech department. Summit is constantly adding new products and new brands to remain on the leading edge when it comes to the latest products. They have an extensive line of truck products and Powersports products for ATVs, UTVs, and dirt bikes, plus all the normal replacement parts for maintenance and repairs. Summit is a dedicated participant in the hot rodding and motorsports arena with sponsorship of the Summit Racing Equipment Show Car Series, racing teams and active participation at all major car shows and events. Summit is fully involved in the performance world and theyu2019re not planning on slowing down anytime soon.